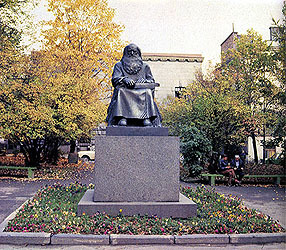 The monument of Petri Shemeikka (1825 – 1915) – the folk-tale narrator – is set up in 1935 to commemorate a centenary of Kalevala first issue. The author is Alpo Sailo sculptor, the lay-out of public gardenis made by Uno Verner Ullberg. This monument is raised from Berg judge's bequeathed means and from the revenue of the Singing Festival in 1926.